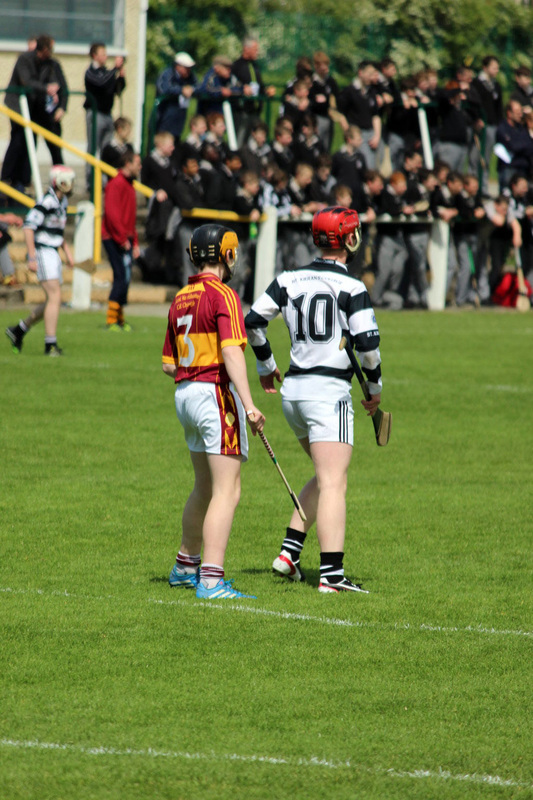 Hard luck to our Juvemile Hurlers who were beaten by St. Kieran's College on May 8th in the Leinster Final. It would have been a sweet victory for CBS given that we already hold the Leinster Junior and Senior titles for this year. However, it was not to be. Well done for the year's work to all of the Juvenile Panel and their mentors, Mr. Dwyer, Mr.Ryan, and Mr. Moran. Enjoy the photos below, captured by TY student Ben Thomson. After some inspiring performances throughout the year, the dream of gaining all three post primary Leinster titles is over. A valiant CBS effort just wasn’t enough for the young side, as the older, stronger Kieran’s outfit was just too much to handle. Expectation was high before of the game as crowds of students from both schools poured into the O’Loughlins grounds, although few expected the end result. But as the teams lined out, it was surprising to see that Kieran’s fielded no first years in their line out, compared to CBS’s four, a factor which certainly came into play in the physicality stakes in this game. The game was quite slow to take off, as CBS began with the wind playing into the O’loughlin’s end. They also played with young Jason Devereux playing as a third midfielder, in the opening passages. After a couple of missed opportunities, Conor O’Keeffe opened the scored for Kieran’s. Minute’s later, Dicksboro clubman Eoin Moylan, moved in full forward, and immediately resulted in a score doubling Kieran’s lead. Centre back Adrian Mullen and full back Luke Murphy began to take a grip on the game with their physicality and aerial power. Tommy Ronan too hassled and harried target man Kieran Galvin, as they began to frustrate the CBS forwards. But the CBS backs too, particularly Mickey Butler and Conor Heary, held strong for much of the opening periods, as Kieran’s put them under a sufficient amount of pressure. It took twelve minutes for CBS to register their first score of the game, Conor Drennan grabbing his first of four points from a placed ball. In the fourteenth minute, Kieran’s pressure finally paid off. Moments after Eoin Moylan fired just over for his second score, he picked up a loose ball out by the sideline. He turned inside struck the ball perfectly into the hand of Eoin Wall, who ducked and weaved before spectacularly finishing into the bottom corner. CBS gave their all trying to respond positively. At times, they could have done with a bit of luck going their way, no more so than with their best goal chance of the game in the seventeenth minute, as Conor Drennan's strike hit the side netting, after latching onto a long ball from Cillian Timmons. The first half petered out from then on, with Ryan Scanlon and Conor Drennan getting a solitary score for their respective sides. CBS were probably disappointed at striking five wides in the half as they trailed by five points, 1-4 to 0-2, though they were lucky not to concede another goal, as Sean Boyd made a spectacular reflex save from Eoin Wall. Hoping to become more potent in attack, CBS introduced Michael Byrne at half back and the pacey Eoin Neary at half forward to the frame. Neary started well, as he seemed to threaten the opposition defence with his direct running style. The James’ Street outfit were full of hope as the half began. But that hope was knocked soon after. Diarmuid Phelan seemed to drop his shot short, but also dropped into the net for his side's second goal of the game. Five minutes later, after an Eoin Wall point, Diarmuid Phelan caught the ball straight from the imminent puck out. Breaking through, he offloaded the ball to Eoin Moylan, as he finished off a fine move, with a fine goal. While the game was beginning to end as a contest, the CBS team never gave up. Conor Heary was the stand out performer from centre back as he was moved to full back with moments left, to steady up the ship. Moments later, Ben Maher’s 21 yard free was expertly saved from Ciaran Brennan, when a goal would have put a bit of a gloss on the scoreline. Kieran’s though, went into overdrive as they began popping over scores from various positions. In the final ten minutes, Scanlon, Phelan and Whelan bagged two points each from positions far out the field, to two Conor Drennan scores for CBS. The pick of these came just before the final whistle blew, with Ross Whelan pointing from half way to add salt to the CBS wounds. Though the scoreline probably showed different, CBS can certainly take heart from their performance, with many of the team eligible for next years competition. Two more first year students, Shane Staunton and Mark Power, were given a run before the end and showed promise for next years team. With this in mind, the CBS juvenile team certainly has a bright future! CBS Kilkenny: S. Boyd, O. Murphy (for M. Byrne 30’), L. Stynes, J. Collins, M. Butler, C. Heary, J. Cahill, J. Sheehan, S. O’Dwyer (for S. Staunton 51’), C. Timmons, R. Dunne, B. Maher, C. Drennan, K. Galvin, J. Devereux (for M. Power 52’). St. Kierans College: C. Brennan, T. Ronan, L. Murphy, M. Nolan, J. Roberts, A. Mullen, S. Phelan, E. O’Shea, K. Egan, E. Moylan, D. Phelan, R. Scanlon, E. Wall, R. Whelan, C. O’Keeffe. 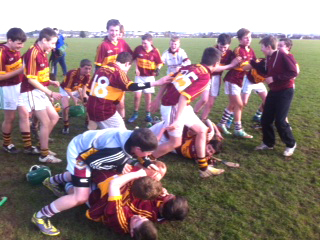 CBS Kilkenny: C. Drennan 0-4 (0-2 frees). St. Kieran’s College: E. Moylan 1-3, D. Phelan 1-3 (0-1 frees), R. Whelan 0-4, E. Wall 1-1, R. Scanlon 0-3 (0-1 frees), C. O’Keeffe 0-1. Preparations for the Rice Cup 2014 have been progressing steadily this year with the team playing a number of challenge games and training hard together as a group. With only two weeks to go until the Rice Cup blitz day qualifiers the panel travelled down to De La Salle in Waterford for the Br Anselm Barrett tournament. This blitz is always of a very high standard with some of the top teams in Leinster and Munster at U-14 level taking part. 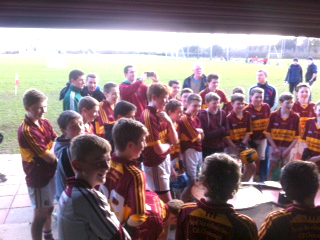 The CBS Kilkenny team travelled with a very young panel in hope of going as far as possible on the day. We had a tough group coming up against Midleton CBS and Blackwater CBS. In our first game we were defeated by a very strong Midleton team that physically we found hard to match, losing on a score line of 2-5 to 1-1. This put our hopes of getting out of the group in danger. However the team responded well to the result. Out second game against Blackwater CBS was a big challenge but a great start saw the team hold on in the second half against a strong breeze on score line of 4-8 to 0-1. Though unaware at the time this scoreline would prover crucial as we qualified for the Cup semi-final on score difference as the best group runner up. In the Semi-Final against Good Counsel we played with the aid of strong breeze CBS got off to a great start scoring two early goals and defended exceptionally well to lead 4-1 to 0-1 at half time. Playing against the breeze in the second half was a massive challenge but one which the CBS panel stood up to. Conceding two goals the pressure was on but a goal with three minutes to go saw the CBS through to the final by 5-1 to 2-1. The final saw CBS Kilkenny come up against Midleton again after the latter had defeated Scoil Ard Rís of Limerick in their Semi. We knew it would be a huge challenge but the players were eager to avenge the defeat of the group game and win the cup. A hard fought first half saw the team 3 points down coming up to half time but a well worked team goal saw it level at 1-1 to 0-4. The second half saw frantic hurling by both sides but hard work by the CBS Kilkenny forwards in winning frees saw the team edge in front. While we missed a number of goal chances the team managed to hold on the Br. Anselm Cup for the second time since its inauguration in 2011. On what was a great day credit goes to all 25 panel members that were involved for the day for what took huge effort from everyone. 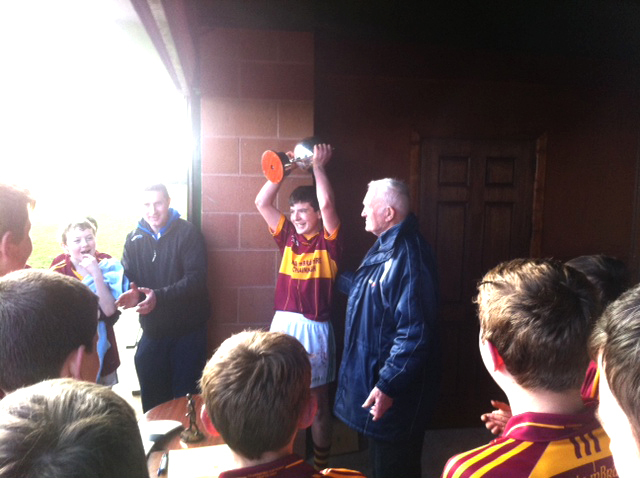 Captain for the day was Conor Heary and Man of the Match in the final was Conor Drennan. Enjoy the YouTube clips below. 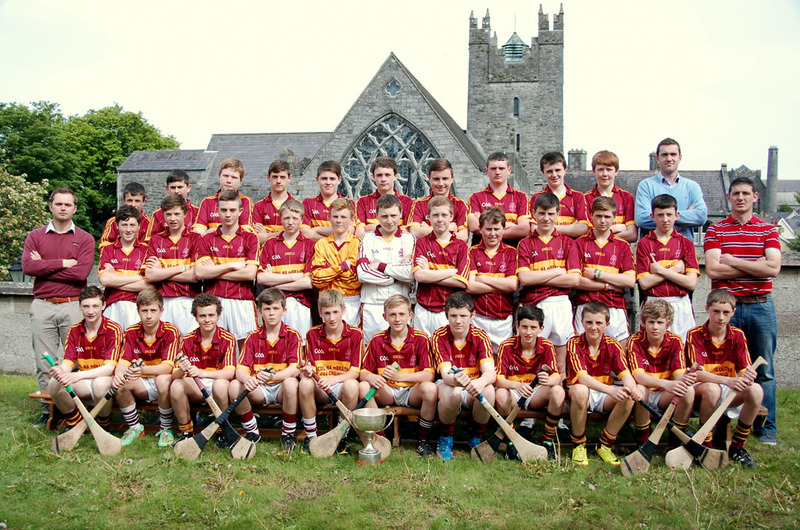 Jamie Malone, Mark Kenny, Conor Heary, Johnny Collins, Mickey Butler, Oisin Murphy, James Dwyer, Luke Hogan, Jack Blagrift, Shane Staunton, Liam Stynes, Conor Drennan, Darragh Galway, Jason Devereux, Jamie Ryan, Daire Maher, Oisin Morrisey, Mark Power, Barry Lawlor, William Ashe-Doyle, Niall Higgins, Joe Coughlan, Chris Cody, Jake O Dwyer, Odhran Lawlor. 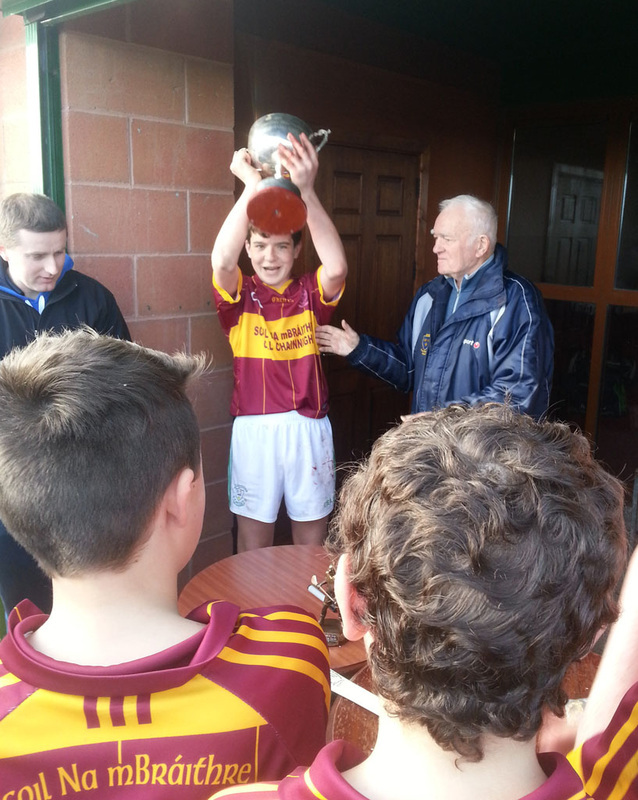 U-14 ½ Progress report March 3rd 2014. The panel is developing very well so far this year with them playing games regularly and training very hard. After three rounds of the league the team has done extremely well to have full points. With only two rounds of the league to go it has given them a very positive start to the campaign. A hard fought victory which was a tricky fixture played in Heywood over the Mid-term break. A strong second half saw the team get over the line after a very slow start in the early stages. This was a very tough game that went right down to the wire. CBS were leading by 7 points with time almost up but a strong finish by a very strong St Peters side led to a nervous finish. Sean Boyd, Padraig Nolan, Sam O’Dwyer, Michael Byrne, James Dwyer, Oisin Murphy, Mickey Butler, Conor Heary, Cillian Timmons, Joe Sheehan, Liam Stynes, Darragh Galway, Justin Cahill, Robert Dunne, Ben Maher, Conor Drennan, Shane Staunton, Mark Power, Eoin Neary, Jason Devereux, Kevin Walsh, Jamie Malone, Steven Holden, Jamie Ryan, Luke Hogan, Aidan Lawlor, Johnny Collins, Keelan O Donoghue, Kieran Galvin. Joe Murphy. 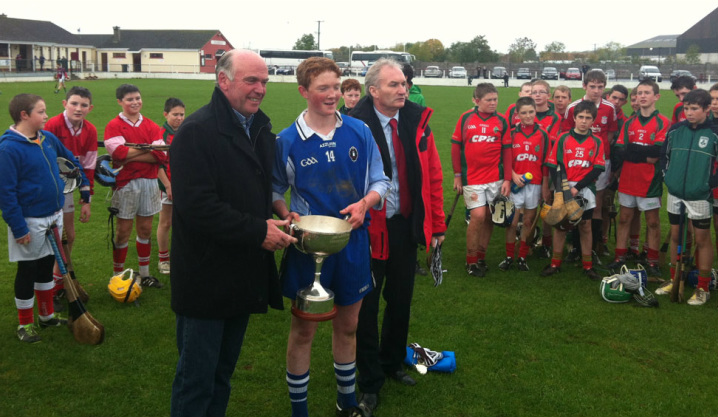 On Wednesday the 6th of November the annual CBS Kilkenny-run Jim Langton Cup was held in the grounds of Palmerstown. 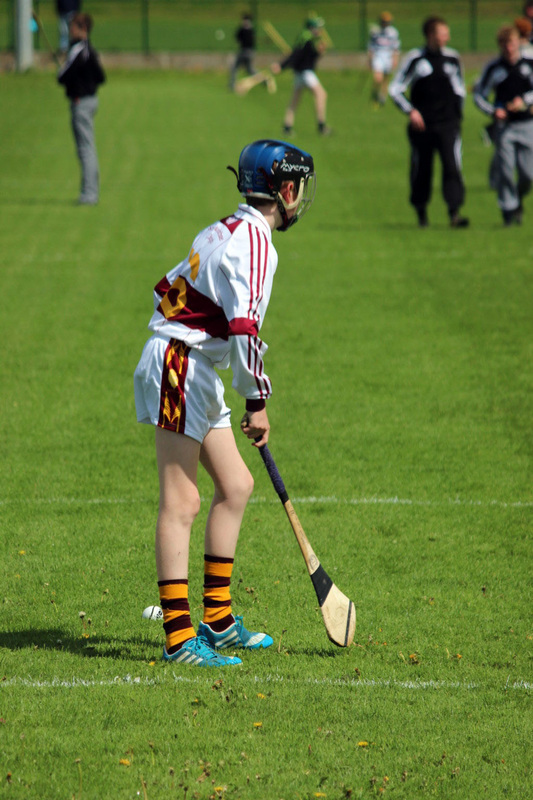 The weather was damp with occasional showers but this did not affect what was a great day of hurling. 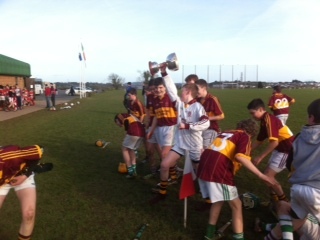 The best U-14 hurlers from schools around Munster and Leinster were present to contest the cup and shield competitions. Teams from Nenagh CBS in Tipperary, De la Salle in Waterford, Midleton CBS and Charleville CBS in Cork all took part; teams from Kilkenny CBS and Callan CBS made up two groups of four which contested the competition. Group one was made up of Midleton, Charleville and two CBS Kilkenny teams. It was a tightly fought group with Charleville topping the group to qualify for the cup final and Midleton finishing second to qualify for the shield final. In what was an extremely physical group the CBS teams competed admirably in the face of extremely tough opposition having drawn with Charleville early on. Group two was made up of Nenagh CBS, Callan CBS, De la Salle and CBS Kilkenny. This group was a little more clear cut with Nenagh CBS going through as group winners to qualify for the Cup final and De la Salle coming second to reach the shield. 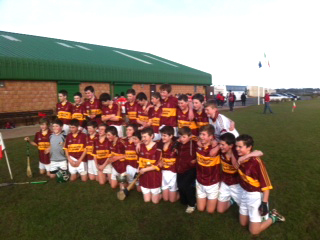 Great effort was shown by both the Kilkenny teams but they were not able to compete with the two qualifiers. 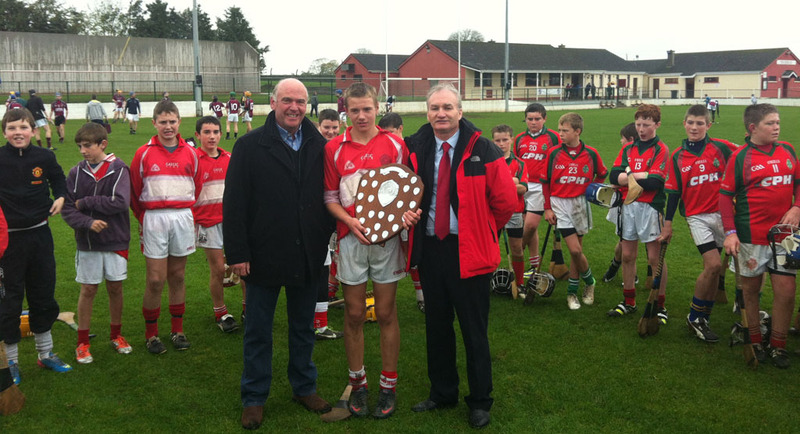 The Shield final was a tight affair between Midleton CBS and De la Salle of Waterford. With the scores level at half time, Midleton just managed to find an extra gear to get over the line on a score of 1-6 to 1-5. The Cup final was an equally exciting game, with it being close up to the very last moments. The game was tight at half time with Charleville being one point ahead. However they were unable to withstand the onslaught from Nenagh CBS in the second half and eventually succumbed on a scoreline of 3-5 to 1-4. A great day was had by all the teams involved and the competitive nature of this competition was highlighted yet again in that no team has won it twice since its inauguration. Special thanks must go to all the teams and mentors, the referees James Barry and John McCormack. Also huge credit is due to the groundsmen at Palmerstown for the condition of the grounds and to Mr Dwyer who coordinated the day and helped to ensure its success. Enjoy the photographs, courtesy of TY students Ben Thomson and Jack Lawlor. This first year blitz was keenly contested in Palmerstown. Weather conditions were testing on a windy afternoon that saw the CBS play three tough games against the very physical opposition of St Peters East, St Peters West and St Brendan’s from Birr. The Class of 1David was joined by Jake O'Dwyer, Chris O'Connor and Pacey McFarlane of 1Brendan. The CBS had a tough start to the day with a game against St Peters East which resulted in a 1-6 to 2-5 defeat to a physically stronger team. After playing against the wind in the first half the CBS were four points down at half time with scores coming from Jake O'Dwyer who was on frees. Great effort in the first half was required and the backs of Barry Lawlor, Luke Hogan and Joe Murphy were some of those not found wanting with Pacey McFarlane assured in the goal. The team pushed hard in the 2nd half with a goal from Christopher Coady and Points from Jamie Ryan but the team just fell short. The 2nd match of the day against Birr was a tense affair with the CBS again playing against a strong breeze for the first half. The mid field pairing of Leon Hayes and Jamie Dwan made life very difficult which resulted in a number of wides for the opposition. With the team down by 2points just before half time, a break started by Nicholas Grace Kelly at corner back was worked all the way up the field to create a goal for Christopher Coady to put CBS a point up at half time. Other players involved in the goal move were Oisin Morrisey, Chris O'Conner, Leon Hayes and Jamie Ryan. The 2nd half was just as tough with great defensive work from Sean Dowling and Darren Mullan while William Ashe-Doyle worked hard in the forward line. With the scores tight the CBS scored another goal on the break through that man Christopher Coady who received a great ball in from Jason Devereux. The CBS held on to win by four points 2-3 to 0-5 with a great clean sheet for the CBS Backs and Goalie Pacey McFarlane. The third game was against St Peters West and was a great team performance that showed skill, courage and hard work. Assisted by the wind in the first half; the CBS led by 1-7 to 1-1 at half time with great scores from Leon Hayes, Jake O Dwyer, Jason Devereux and Jamie Ryan with the goal scored by Jack Hawe. It was an excellent team effort. The 2nd half was a war of attrition with the CBS goal under siege for much of it, a break away point by Christopher Coady the only relief for the CBS. With the whole team making a huge defensive effort they managed to hold on for a hard earned draw. 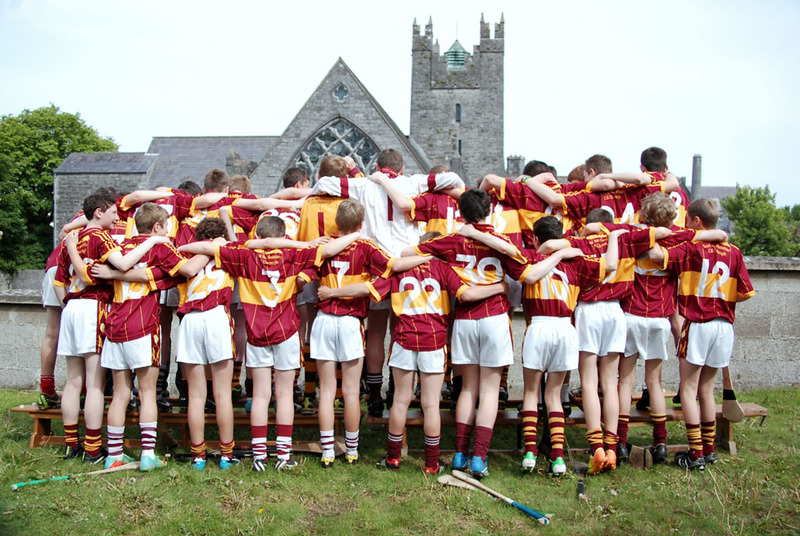 On an ideal day for hurling in a well laid out St Johns Park in Kilkenny the collective hurling force of class Colmcille collected three wins and a draw against Borris 1 and 2, Birr and CBS Fergus. The Colmcille class panel consisted of 17 players who all participated equally throughout the course of the day. In the opening game v Borris 1, Colmcille prevailed 1-6 to 1-2 with the scoring tally been divided up between Justin Cahill, Conor Drennan and Jordan Brennan in a tough bruising encounter. A quick turnaround involved the team going straight back into action against another Borris selection and they battled gamely throughout with AJ Dobbyn excelling in his role at full forward with Evan West and Mark Power formulating a good partnership at midfield. The game ended in a one point victory 2-6 to 3-2 with the backs excelling in holding out a vastly more physical Borris team with the small in stature defense of Oisin Murphy, Tom O Donnell, Colm O'Grady and team captain Tommy Walton now positioned at wing back all clearing an amount of ball. In the third game v Birr, Colmcille really started to express themselves as a team with great interplay between all the team members. In this particular game the dynamic Niall Higgins, the versatile Joseph Lacey, John Cassin, Oisin and Jack Tynan were all to the fore as the team ran out winners 2-9 to 1-2. To conclude the day the two CBS teams Colmcille and Fergus played out a thriller of a final which finished level 3-4 to 3-4 with Colmcille holding on after looking the stronger in the first half. 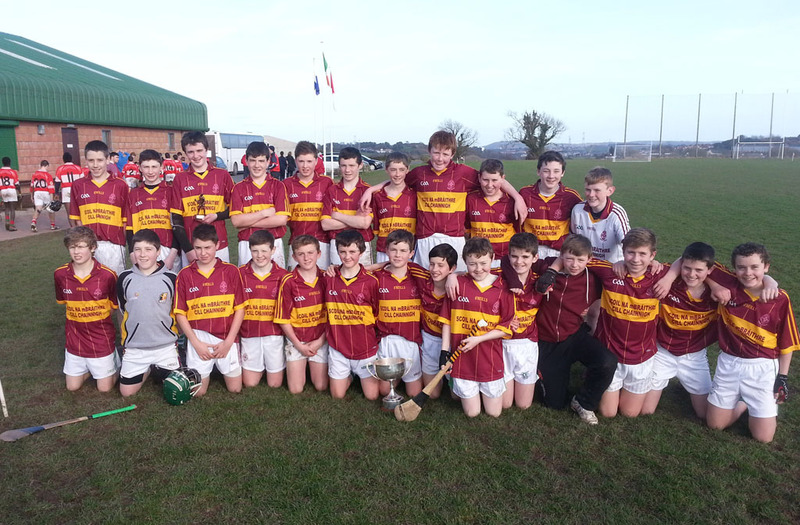 The standard of hurling from the two classes was a joy to behold and bodes well for the future of hurling in the CBS. The first half saw Colmcille lead 3-1 to 1-1 with the lively Gavin Phelan and Conor Drennan grabbing the goals for Colmcille, however, the second half saw Fergus thunder back into the game to grab a late equalizing point after a number of heroic saves from the agile netminder Mark Kenny. After a great days hurling in St. Johns Park, CBS Fergus managed to must up muster up two draws against Borris 1 and CBS Colmcille and two magnificent victories against Borris 2 and Birr. There were all star performances all over the field for CBS Fergus. Picks of the day were Shane Staunton who finished the day with a tally of at least 1-6, Bill Butler who rounded off his day with a score of 1-3, Darragh Galway who scored 0-2 and Conor Mulhal whose goal was vital in forcing a draw against CBS Colmcille. However there were other great performances all over the pitch. Liam Hennessy and Killian Fitzgerald were pillars in the full back line and Jake Fahey commanded the half back line in each game giving great service to his forwards. Dáire Maher and Jack Kearns impressed throughout sweeping up lose ball around the middle and Shane Staunton made sure the he won every single ruck and maul around the park. 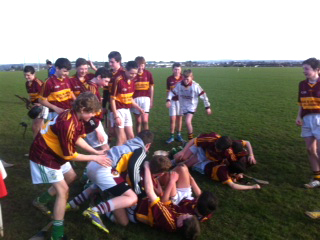 The game of the day came when CBS Fergus and CBS Colmcille clashed in the latter stage of the day. CBS Colmcille, led by Mr. Mulhall, roared into the lead but strong performances from James Dwyer and Jason Hayes helped CBS Fergus close the gap and eventually come away with a draw.